What’s the best travel camera? Ultimately, it’s the camera that you’ll want to bring with you everywhere, so you won’t miss that amazing shot. Depending on the photographer, the ideal camera for travel could be anything from your iPhone to a large format pro camera. But for the purposes of this article, we’ll focus on relatively small, easy to carry travel cameras, from mirrorless to point and shoot. ]The Fuji X-T2 is easily our favorite on this list, thanks to its incredible color reproduction and ease of use. The X-T2 produces sharp, gorgeous photos, even in low light, that need minimal post processing. Instagram addict? Images can be quickly transmitted to your phone with the WiFi feature. Even pro photographers talk about how the vintage style adjustment dials help you to feel more connected to the camera settings, but they’re especially helpful for beginners who are getting used to manual controls. All of this comes in a significantly smaller and lighter package than a DSLR, making it a perfect camera for travelers. As with other mirrorless cameras, the lenses are interchangeable, offering significant flexibility and functionality over a point and shoot. Among mirrorless cameras, Fuji makes some of the best lenses, with the widest range of offerings, so you’ll be able to find a lens perfect for your travel and photography style. when the camera’s metering is over or underexposing. Also great are the Aperture rings on most Fuji lenses. Rather than digging into the camera menus on a screen to access these settings, they’re right in front of you for quick adjustments. It makes the camera settings more tactile, less abstract, and faster to adjust on the fly. It’s worth repeating that the color processing is possibly the best out there. If you don’t want to spend time editing every photo in Lightroom, or just need a quick turnaround, Fuji is one of the best travel cameras you can buy. What don’t we like? Honestly, there’s not much to put here. The battery life isn’t fantastic, but this is a common complaint with mirrorless cameras. As with many of the other cameras on this list, we recommend eventually purchasing an extra battery or two–or even thinking about the vertical grip to dramatically expand your shooting time. The Sony a7R II is the first full frame mirrorless camera, offering the higher image quality that usually comes with a full frame sensor in a smaller, lighter weight camera body. Those higher quality photos come at a price: the a7R II is $1,000 more than the Fuji X-T2 with kit lens, and that’s for just the camera body! Still, there’s some compelling reasons why it’s a good camera for travelers. The a7R II gives you the closest to DSLR image quality in a more portable package. Because it offers the highest ISO range of any camera on this list, the a7R II will really outshine competitors in low light situations. You’ll also see a boost in megapixels: at 42.4, it’s by far the highest on this list, actually coming in at twice the megapixels of most of the other mirrorless cameras here. including a series of Zeiss lenses. All of this makes for some of the highest quality images and video available in a mirrorless camera. What don’t we like? Sony has worked out most of the kinks in the a7 line in previous iterations. However, when shooting in a burst, or recording video, the buffer is slow to clear, leaving you waiting to review photos — or do anything at all with the camera. And then there’s the cost. Sony’s a7R II is undoubtedly a great camera, but you should ask yourself if the higher price tag is really worth it. Will you do enough low light or night photography to get your money’s worth? Are you printing your photos large enough to notice the difference in image quality, or will they mainly be shared online? Panasonic’s mirrorless camera is a solid offering at a reasonable price. It offers competitive image quality and 4K video recording, with a rugged body and touchscreen interface, making it a good camera choice for price conscious travelers. As with any mirrorless, you’re getting awesome image quality in a smaller package. In addition to the features you expect from a mirrorless camera, the Lumix DMC-GX8 also offers some interesting features you won’t find elsewhere. The camera body is designed with the outdoors in mind, with splashproof and dustproof sealing. It features two OLED screens: the large back touchscreen monitor, and an extra large pop-up viewfinder. The touchscreen works much like an iPhone camera, in that you can simply touch the area of the photo preview that you’d like to focus on, which is a handy feature. shut out distractions and compose your photo, while improving upon standard viewfinder design. What we don’t like: The monitor has limited articulation compared to the the X-T2 and the a7RII, the image stabilization could use some improvement, and the lens selection is modest, but not as wide as we’d like to see. Olympus’ new high end mirrorless, the OM-D E-M1 Mark II is a favorite of pros looking for a lighter kit while maintaining image quality. In fact, travel photographer Lauren Bath shoots many of her photos on this camera! (And if you’re an aspiring travel blogger, check out our Ultimate Resource List to launch a travel blogging career). quite a few features that help it to stand out. The in camera focus stacking is a particularly neat one: if you’re ever taken macro photos, you’ve probably noticed that it’s difficult to focus on an entire bloom or insect that close up. The camera will automatically do what pros do in this situation: take a series of photos at varying focal points, and combine them into one sharp image! per second rate in burst shooting, handy dual SD card slots, weatherproof construction, and WiFi, and you’ve got a camera that travelers should give serious consideration. What we don’t like: There’s very little to complain about with the Olympus OM-D E-M1 Mark II. We rarely do flash photography, so it’s not something we’ve noticed, but some photographers have had issues with autofocus when using an external flash. In addition, be aware that lens adapter kits (for example, to use a Canon lens with the Olympus mount) won’t work with this camera. With a megapixel count rivaling mirrorless cameras, handsome retro design, and pocketable size, Canon’s brand new G9 X MK II is a point and shoot that’s awesome for the stylish traveler, yet powerful enough to take seriously. significantly more attractive design than most point and shoots. As a point and shoot, it’s compact and easily tossed in a pocket or purse, yet boasts some nice features, including HD video with time lapse function, good low light performance, 3x optical zoom, WiFi, and RAW capture with in-camera RAW processing. camera RAW processing lets you make tweaks and save as JPEG for an instantly shareable photo. What we don’t like: The downside of a the stylish casing is that it’s not as weatherproof as others. That’s not a problem for everyone, just keep in mind that this probably isn’t the best choice for adventure travel. Also worth noting is the lack of optical viewfinder; you’re limited to composing photos exclusively through the electronic viewfinder on the LCD screen. Fuji consistently makes fantastic cameras, and the X100F is no exception. While a little pricey for a point and shoot, there’s a reason why pros frequently reach for compact Fuji point and shoots when they want to travel light. There’s quite a few reasons to recommend the Fuji X100F, many of which are present in the X-T2: the intuitive retro dials and focus level make utilizing the manual controls easy, and of course you get Fuji’s excellent color rendering and built in film simulations. shoots. Because it is a point and shoot, the fast F2 aperture lens isn’t removable, but Fuji makes zoom and wide angle conversion lenses that fit on top of the camera’s lens for added flexibility. Note that since the camera doesn’t have optical zoom, it’s essentially a prime lens without a conversion lens added on. Another cool feature is the built in neutral density filter. Normally when you shoot something like a waterfall, and want to get a nice blurred moving water effect, you’d set a long exposure, and add a neutral density filter. in during the long exposure. You don’t need an ND filter with the X100F, because it has a built in setting available at the push of a button. What we don’t like: We can’t complain about the performance of the X100F, but the price is a bit of a sticking point. Buying the camera plus the conversion lenses would easily put you in the price range of the much more powerful Fuji X-T2 in the list above. Is it worth it? Possibly, if you’re determined to stick with a compact point and shoot size camera, and will take advantage of the extra bells and whistles on the X100F. Olympus’ TG-5 is a rugged point and shoot specifically designed for harsh weather. But it’s not just about the tough exterior; the TG-5 has a lot to recommend it to travelers. features seen in other point and shoots on this list with the added benefit of standing up to a A LOT more abuse! It’s waterproof up to 50 feet, freezeproof down to 14 degrees F, shockproof up to a 7 foot drop, and crushproof up to 200 lbs, with an anti-fog lens. Fuji above, you’ll have RAW capture and the option to add on fisheye or zoom conversion lenses that can be used with an adapter ring. What we don’t like: The TG-5 offers the fewest megapixels of any camera on this list (however, its low light performance has been markedly improved from the prior version). Overall, the images are great, and the megapixel count is a small trade-off for a reasonably priced, rugged camera. Our final point and shoot for travelers, the Sony RX100 V is a little pricey, but offers some features you won’t find in other compact cameras. and nice color reproduction. This along with all the standard point and shoot features, and a 3.6x optical zoom, in a super compact package. What we don’t like: We’d like to complain about the price, but if you have the cash, the RX100 V really is a great choice. One small complaint: in a camera this expensive, we’d love to see touchscreen focus selection, or a focus lever like that found on Fuji cameras. The autofocus is fast and effective, but you’ll spend a moment choosing the correct focus mode from the menus, when you could just quickly tell the camera what to focus on. It’s trite, but the best camera is the one you have with you. Because so many people carry their smartphone everywhere, there’s much to recommend it as a travel camera. You don’t have the budget for any of these cameras: Hey, that’s ok. You can get some pretty great shots with smartphone cameras nowadays. In fact, you’ll get about the same image quality that you would with a lower end point and shoot. You want to travel really light/ you’re always losing things: While all of the cameras on this list are smaller and lighter than DSLRs, they’re still something else to remember and make space for. Be honest with yourself about whether you’re likely to bring the camera with you everyday. You want a really simple camera: Even the most user friendly of the cameras on this list won’t give you the best results if you don’t know how to use it. Yes, you can turn on a point and shoot and use fully automatic settings, but many of the neat bells and whistles require at least knowing when to turn them on or off (and how to do that in the first place). 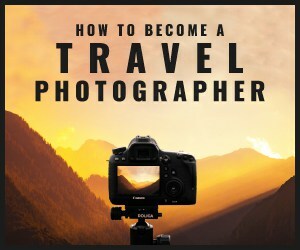 Why aren’t there any DSLR cameras for travel on this list? We feel that mirrorless cameras have advanced to match the performance of entry level DSLRs on many fronts, and most travelers won’t need–or have the budget for– intermediate to pro level DSLRs. We’re also making the assumption that if you’re reading this article for advice, chances are you’re not a pro travel photographer (yet!). Mirrorless cameras really can be some of the best cameras for travel: you get amazing shots with very few trade-offs, so don’t feel like you’re missing out by avoiding larger, heavier DSLRs. You’re taking the plunge and buying a new camera; do you need to splurge on accessories too? For both mirrorless and point and shoots, there’s a couple things to consider. First, don’t forget an SD memory card! If you’re like me, and lazy about clearing old photos off of your card, and/or shooting RAW, the larger capacity, the better (with RAW photos, it’s very easy to fill up a 64GB memory card over a week long vacation). You may be able to get by with an older memory card if you have one, but be sure to check if your camera requires a newer UHS-3 card for optimal writing speeds — this is most important for shooting 4K video. Next, if the camera didn’t come with one, you should think about getting a pouch, camera bag (see our list of stylish camera bags for women, or CLICK HERE to get a $25 discount on your first ONA camera bag), or case to keep the camera clean and protect it. You may also want an extra battery or two, depending on how many photos you plan to take. A good way to test this is to take the camera out on a day trip and see how the battery holds up. Headed on an international trip with your new camera? Check our Travel Power & Plug Adapter Buyer’s Guide to see if you’ll need a plug adapter or power converter to charge your camera’s batteries. Each lens for your camera is a significant investment. Photographers commonly use a UV filter on their lenses to protect the glass. This is two-fold: the filter is a physical barrier that prevents scratches, and it will absorb some of the shock if the camera is dropped. (The filter will also reduce any potential bluish cast in your photos). Many photographers (myself included) have stories of accidentally dropping their camera, and cracking the filter glass, but fortunately not the lens glass. It’s a lot cheaper to replace a $20 filter than repair or replace a lens. How do you choose a filter? It doesn’t need to be expensive; we’re partial to B&W Filters, but Amazon Basics makes some UV filter sizes for just $6-$7. The Amazon listing details for your lens should have a section in the Technical Details called “Photo Filter Thread Size.” Once you have that, just search for the millimeter size plus “UV filter.” So, for example, searching for “67 mm UV Filter” will give you a bunch of filter options to choose from. Each lens you buy will likely fit a different size filter, so if you’re buying multiple lenses, you’ll need to check the size for each. Hoping to get those Instagram worthy shots? You’ll need to spend some time learning your camera settings in-depth. If you’re a manual reading type, go ahead, but we find that there’s frequently online tutorials available that may walk you through setup and usage a little more clearly. In addition, if you’re serious about taking great photos, you should start shooting in RAW and learn to use Adobe Lightroom. As you learn more, you’ll start to see that sometimes the only thing separating your photos from those of the pros is time spent editing. Lightroom offers a fantastic photo editing toolset, and isn’t as difficult to learn as Photoshop. What’s the difference between DSLR and Mirrorless, and how are Mirrorless cameras different from Point and Shoots? As the name implies, mirrorless cameras don’t have the mirror that bounces the scene up into what is known as an optical viewfinder. Instead, the light passes directly to the sensor, and you get a digital image preview on the back monitor screen (if the camera has a viewfinder, it is an electronic viewfinder rather than optical). Mirrorless cameras are smaller, because they don’t need to make space for the mirror. They also generally have smaller sensors than DSLRs. Aren’t point and shoots mirrorless too? Yep. While both are without mirrors, mirrorless cameras with interchangeable lenses have become known as Mirrorless, or Compact System Cameras. Beyond the ability to change out lenses, one big difference between Mirrorless and Point and Shoot cameras is the sensor size, which we talk about below. A Megapixel is one million pixels. You only need 1-3 megapixels for a high enough resolution for computer screens, and just 4 to make an 8×10 print. More megapixels will come in handy if you want to crop a photo for composition or use the crop to “zoom” in on a section. Let’s say you go on safari, and even your zoom lens didn’t get you quite as close as you’d like. You crop the photo around the animal, taking off about 50% of the photo (this is of course assuming your focus and exposure were set correctly so that the subject is still sharp when you zoom in). extra pixels come in handy. That said, all of the cameras on this list have more than enough megapixels for most consumer uses, and megapixels are only part of the formula that give you a sharp, noise-free photo.those extra pixels come in handy. WiFi is becoming a common feature on new digital cameras, and it’s a must-have for us. It works like this: the camera puts out a WiFi signal that your smartphone or tablet can pick up, generally via a free, downloadable app. When you want to quickly download photos from your camera on the go, switch on the WiFi, open the app in your phone, and choose which photos to download. It makes Instagramming or sharing photos with friends quick and easy. There are quite a few different camera sensor sizes, and we won’t go into all of them here. (This Adorama article is helpful if you’d like to read more). A standard full-frame DSLR camera has a sensor size of about 43mm measured on the diagonal. Mirrorless cameras range from 21.5-33.5mm, and Point and Shoot sensors are 15.86mm. What is important to know, is how sensor size affects image quality. While as a general rule, a larger sensor size means better quality photos, advances in technology have led to huge improvements. Our favorite mirrorless, the Fuji X-T2 does an excellent job of suppressing noise in low light situations. The photo on the right was taken in a dimly lit bar, and edited to lighten it considerably. Viewed full size, you can see a little bit of noise beginning to emerge, but surprisingly little given the low light. Much of this is thanks to Fuji’s X-Trans CMOS III Sensor and processor– it’s not just about sensor size. Frames per second refers to the how fast a camera can take photos in a quick burst. If you’re a landscape photographer, it won’t be relevant for you, but a high FPS is useful for quick moving objects and situations like sports photography. To get the most out of your camera, make sure you use the manufacturer recommended memory card speed class. If your camera is rated 14 FPS, but your memory card doesn’t have a fast enough write speed, it will lag, and you won’t get 14 frames per second. RAW photos are images straight from the camera sensor with minimal processing. They don’t always look amazing as-is, but retain more data than JEPGs, which allows for more flexibility in editing. For example, the lightened photo above is an edited RAW image. If we’d attempted to lighten a JPEG to the same extent, you’d see more noise and less detail in the shadows. RAW format can be very useful for even hobby photographers once you learn some of the ins and outs of editing. You will need a special program to edit RAW photos: Adobe Lightroom is what many pros use, but it actually isn’t too complex or difficult to learn, and can make a huge difference in imperfect photos. Many cameras allow you to shoot simultaneously in RAW and JPEG. It’s a feature we love, because you have JEPGs available for instant sharing, while storing RAW photos for larger tweaks later. What Are the Different Camera Sensor Sizes? Photographer, writer, and digital nomad.